Ooh this card just “scares” me with the haunted house on the hill. It is so very “Halloween-y”! What a fun way to create the hill with ripped pieces of black cardstock. 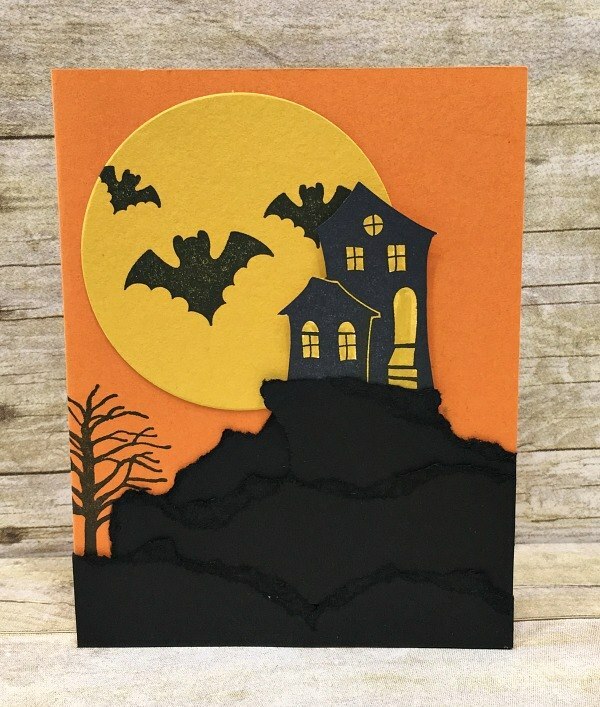 The Halloween Scares stamp set makes a simple and “scary” card for your favourite halloween ghouls!! I’ll have some more Halloween cards on the blog this week at www.stampwithjenn.com. All suppplies used to make the card are below including instructions for making this Halloween Scares card. Stamp the house image on Whisper White cardstock using Basic Black ink. Cut out the house using scissors. Color in the windows using the Crushed Curry marker. Die cut a circle from Crushed Curry cardstock using the Layering Circles Framelits. Stamp the bats on the circle using Basic Black ink. Use a 5” x 4” piece of Basic Black cardstock, begin to tear the paper, towards you, to create strips. Don’t worry about being precise as the unevenness of the tears and depth add to the character of your finished ‘mountain’. Tear the first strip straight across so that it will be 4” wide when finished. Tear the next strip wider, ripping it shorter than the first layer. Repeat this process until you have a small piece resembling a hill or cliff for the top as shown. Place, do not adhere, the first long strip of Basic Black cardstock on the Pumpkin Pie card base. Stamp the tree image using Basic Black ink. Adhere the first long strip of Basic Black cardstock to the bottom of the card base, leaving the top, backside free of adhesive so you can layer the next strip behind this one. Continue layering the Basic Black strips in the same manner creating layers of to resemble a hill. When you reach the top, adhere the house image using Dimensionals, leaving room to adhere the moon. Adhere the rock/cliff piece of Basic Black cardstock as shown. Adhere the Crushed Curry circle, tucking it slightly behind the house as shown. If you like these kind of instructions be sure to check out my Monthly Project Sheets. Emailed to you for free when you place a $50 order.